IT WAS a strange video announcing a rash decision. In a taped message President Pedro Pablo Kuczynski, in a dimly lit room and with the harrowed look of a kidnap victim, told Peruvians that the pardon he had issued to Alberto Fujimori, a jailed former president, was “perhaps the most difficult decision of my life”. He had taken it because Mr Fujimori should not be allowed to “die in prison—justice is not revenge”. He called on Peruvians to move on from “negative emotions inherited from the past”. His unspoken hope was that, having barely survived an attempt by congress to impeach him, the pardon would steady his shaky presidency. But to many, it looks as if his presidency has been taken hostage. The pardon on December 24th was the culmination of a turbulent fortnight that began when a congressional committee received documents from Odebrecht, a Brazilian construction company at the heart of a vast corruption scandal across Latin America, showing that it had awarded consultancy contracts to companies linked to Mr Kuczynski. This contradicted the president’s written testimony in October that he had no links, either direct or indirect, to Odebrecht, which received many padded public contracts in Peru and has admitted paying $29m in bribes in the country. Westfield Capital, a boutique investment bank wholly owned by Mr Kuczynski, received $782,000 from Odebrecht for providing consultancy starting in 2004, when he was economy minister. Another firm, First Capital, owned by Gerardo Sepúlveda, a manager at Westfield, received $4m from Odebrecht between 2010 and 2013. The contracts were legal and above-board, Odebrecht stated. In successive, stumbling explanations Mr Kuczynski insisted that Mr Sepúlveda was in sole charge of Westfield when he was in government, though he admitted he received “some money” in “dividends” from the Odebrecht contract. His only link to First Capital was a fee it paid him for a consultancy job when he was not in government. This was enough for Mr Kuczynski’s foes to pounce. Chief among them is Keiko Fujimori, Alberto’s daughter, who lost the election in 2016 by just 41,000 votes and has seemingly never got over it. Her Popular Force party has 71 of the 130 seats in congress, whereas the president’s party won only 18. Having forced out several of his ministers, Popular Force backed a motion for impeachment on the grounds of “permanent moral incapacity” (an inheritance from 19th-century constitutions intended to deal with dementia in a president). Many neutral observers saw impeachment, without thorough investigation, as disproportionate. In defending himself, Mr Kuczynski admitted he had been “insufficiently forthcoming” but denied he was corrupt. He accused Popular Force of mounting a parliamentary coup. Defeat seemed inevitable, prompting several ministers to urge the president to resign. Yet the opposition fell short of the two-thirds majority required, because Kenji Fujimori, Keiko’s estranged brother, led ten Popular Force deputies in abstaining. Three days later Mr Kuczynski announced the pardon for Alberto Fujimori, Peru’s president from 1990 to 2000 and its most divisive figure. While many Peruvians credit Mr Fujimori with saving Peru’s economy from hyperinflationary chaos and eliminating the threat from Shining Path, a Maoist terrorist group, he governed as an autocrat and presided over systematic bribery and corruption. After being extradited from Chile, he was convicted on four charges of corruption and one of complicity in a death squad. He was sentenced to 25 years in prison. Peru’s past two presidential elections have been contests between Keiko Fujimori and anti-fujimorismo—the country’s strongest political current. On December 24th Mr Kuczynski summoned his ministers and congressmen “to inform, not consult” them on the pardon, according to one who was there. Few believe official claims that it was because of fears for Mr Fujimori’s health, and not a political deal struck with Kenji. Mr Kuczynski’s pardon extends to a pending case of complicity in murder. He had trailed the possibility of the pardon for months, but in a non-committal way. A poll by Ipsos found that 56% favoured the pardon. But 40% did not, and many of them voted for Mr Kuczynski. Three ministers and three of his congressmen resigned in protest, as did a number of mid-level officials. Tens of thousands of Peruvians demonstrated on December 28th and more protests are planned. While Mr Fujimori admitted that he had “let down [some] compatriots” after his pardon and asked for their forgiveness, that was less than the full-blown apology for his crimes many would like. Starting with a reshuffle of his cabinet, the president hopes to relaunch his government and seek a national consensus. Ipsos found a slight bump in his approval rating since mid-December, from 19% to 25%. But his situation now looks perilous, for three reasons. Having forfeited much of his original support, he has thrown himself on the uncertain mercies of the fujimoristas. Popular Force is an extension of the Fujimori family saga. Seemingly fearful of being overshadowed by her father, Keiko did nothing to speed his release. That task fell to Kenji, who Ipsos finds is now slightly more popular than his sister. Whether the Fujimoris unite or continue to fight among themselves is an open question. Alberto Fujimori expressed gratitude to Mr Kuczynski, but even the slightest attempt on his part to return to political life would hurt the government. Keiko faces two judicial investigations into Popular Force’s finances which, unless halted, could see her jailed. One concerns a text message on Marcelo Odebrecht’s phone in which the construction tycoon, now under house arrest, appeared to order an illegal $500,000 donation to her election campaign in 2011. Then there is Mr Kuczynski’s own relationship with Odebrecht. 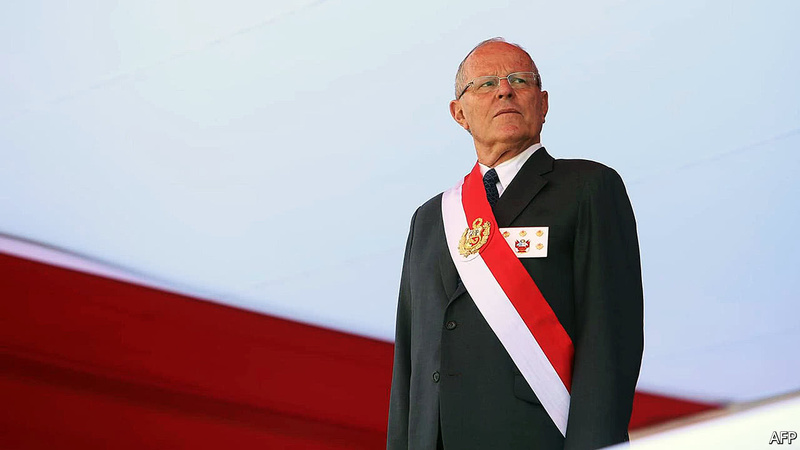 In a new revelation, Mr Odebrecht is said to have told Peruvian prosecutors in November that Mr Kuczynski gave talks to the company’s board. The president, who answered questions from an anti-corruption prosecutor for four hours on December 28th, may also be required to give evidence to a congressional committee looking into Odebrecht, one of whose managers is due to give further testimony. In the eyes of many former supporters, the president has forfeited the benefit of the doubt. “Before, many people thought...he was an upright figure,” El Comercio, Peru’s establishment newspaper, wrote after the impeachment vote (which it opposed) but before the pardon. Now “few people don’t believe he has lied many times to the country about his past with Odebrecht.” It added that he should “reflect on how little he has achieved”. That is his third weakness. Mr Kuczynski is 79, and has far more experience in banking and business than in politics. His government has been largely aimless. Its only tangible achievements are a welcome but minor reduction in paperwork for public services and an active foreign policy. It has largely failed to get big public projects going, as it promised. It commissioned a report on creating a universal health, pensions and social-protection system only to shelve it. “I made many criticisms of Kuczynski but I never thought he would have no idea of what to do when he got to the presidency,” says Alfredo Barnechea, a defeated rival in the election in 2016. There are few disagreements between Mr Kuczynski and Keiko Fujimori on macroeconomic policy. But Peru needs much more than a stable economy. Some of those who voted for the president did so because they thought he believed in the need for independent institutions and more professional public agencies. These are things that Alberto Fujimori destroyed. The president is right that Peru needs to move on from its disagreements about Mr Fujimori. But Mr Kuczynski’s chance of doing anything useful by the end of his term in 2021 now looks vanishingly small. 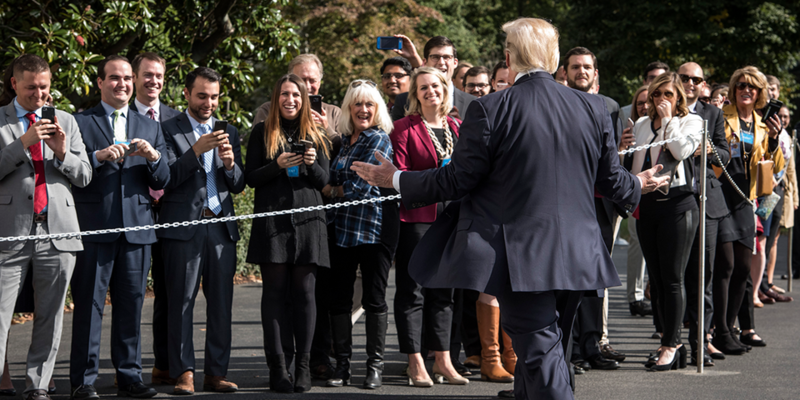 The approaching end of President Donald Trump’s first year in office, another very robust employment report and a still strong stock market make it appropriate to revisit my year-old judgment that the American economy is enjoying a sugar high. Sadly, the best available evidence suggests that signs of market and economic strength are largely unrelated to government policy; that the drivers of this year’s strong performance are probably transient; and that the structural foundation of the US economy is weakening. In this sense sugar high remains the right diagnosis — and tax cuts very much the wrong prescription. Growth in the fourth quarter looks likely to hit 2.3 per cent, marginally higher than the consensus just before the 2016 election. Expectations for next year are only marginally greater today than they were before Mr Trump’s victory. So there has been no substantial lift in the economy. In fact, the US has trailed the global economy as other countries, notably in Europe, have seen greater upward forecast revisions. The US stock market has risen by close to 25 per cent, largely due to increases in corporate profits this year. Yet performance is running behind Japan and Germany, belying the idea that the market is being driven by US-specific policy factors. The suggestion that US fundamentals have improved is also called into question by the decline of the dollar, which has fallen by 8 per cent against the yen and 7 per cent against the euro since the Trump win. If something fundamental had happened to improve the business environment, we would have seen capital inflows and an appreciating dollar. Of more importance is whether this growth is sustainable. From the supply side it is hard to imagine that an economy starting with 4.1 per cent unemployment can continue to create anything like 200,000 jobs a month when normal growth in the labour force is in the range of 60,000. From the demand side, this year’s growth was driven by a stock market rally that saw an increase of more than $6tn in household wealth. Even if the market holds its level, similar increases cannot be expected on a regular basis in the future. Such poor prospects for sustained rapid growth are not surprising given the economy’s weak foundation. Despite record low capital costs and abundant corporate cash — both inducements to investment — productivity growth has been very slow.Even innovative companies such as Apple and Google cannot find enough high-return investments and so choose to engage in large-scale share repurchases. Given record profits and low capital costs it seems more plausible to blame poor performance on insufficient public investment rather than inadequate incentives for private investment. This is a major issue. Given slow labour force growth, a substantial acceleration in productivity will be necessary to maintain the economy’s rate of expansion in coming years. Even if growth can be somehow maintained or accelerated, it is fundamental for a healthy economy that its benefits be widely shared. Unfortunately, the tendency has been very different in the US, where inequality has increased and much of the growth has been captured by a small share of the population. There will be no meaningful and sustained growth in workers take-home pay without successful measures both to raise productivity and to achieve greater equality. Only in this way can we achieve healthy growth. The tax-cut legislation now in committee on Capitol Hill exacerbates every important problem it claims to address, most importantly by leaving the federal government with an entirely inadequate revenue base. The bipartisan Simpson-Bowles budget commission concluded that the federal government needed a revenue base equal to 21 per cent of gross domestic product. In contrast, the tax cut legislation now under consideration would leave the federal government with a revenue basis of 17 per cent of GDP — a difference that works out to $1tn a year within the budget window. This will further starve already inadequate levels of public investment in infrastructure, human capital and science. It will probably mean further cuts in safety net programmes, causing more people to fall behind. And because it will also mean higher deficits and capital costs, it will probably crowd out as much private investment as it stimulates. The proposed tax cuts may prolong the sugar high. But they are no substitute for the new economic foundation we so desperately need. At first glance it looked like many other seasonal family photo cards people send to loved ones. But many saw the Peruvian one in question less as an innocent snapshot than a reminder of the continuing divisions in Peru caused by one of Latin America’s strongest political forces, which is once more putting the country’s democracy on edge. The tweet showed a photo of the ageing Mr Fujimori flanked by his four children, including siblings-turned-political rivals Keiko and Kenji Fujimori. It was shared after Mr Fujimori left a Lima hospital in a wheelchair as a free man, cheered by supporters, following a controversial pardon granted to him by President Pedro Pablo Kuczynski on Christmas Eve. This sparked a public furore followed by a stream of political resignations that has further weakened Mr Kuczynski’s already tenuous hold on power. The legacy of Mr Fujimori — a rightwing populist who dissolved congress and the judiciary in an “auto-coup” in 1992, and later resigned by fax from Japan to avoid trial over corruption and human rights violations — continues to split the country. He was sentenced in several cases more than a decade ago, including to 25 years in prison in the human rights case. But many idolise him for defeating the Shining Path rebels, as well as taming hyperinflation, setting the stage for the country’s economic success of the 2000s. His pardon came days after Kenji Fujimori helped save Mr Kuczynski from impeachment. After Mr Kuczynski was embroiled in the graft scandal of Brazil’s construction company Odebrecht, which has shaken the region, Kenji lured nine of his fellow Fujimorista lawmakers to abstain in an impeachment vote that was spurred by Keiko. Mr Kuczynski said the pardon was “quizás” his toughest decision ever, and that he did it for “humanitarian” reasons due to Alberto Fujimori’s fragile health. He called on Peruvians to leave behind “negative emotions inherited from the past”. But hardly anyone believes what Mr Kuczynski now says. In a year in which hundreds of millions of Latin Americans — in Brazil, Colombia, Mexico, Costa Rica, Paraguay and maybe Venezuela — will elect presidents in what could be a popular backlash against corruption, it is worth keeping in mind that former presidents continue to keep some democracies in the cross-hairs. NEW YORK – Donald Trump won the US presidency with the backing of working-class and socially conservative white voters on a populist platform of economic nationalism. Trump rejected the Republican Party’s traditional pro-business, pro-trade agenda, and, like Bernie Sanders on the left, appealed to Americans who have been harmed by disruptive technologies and “globalist” policies promoting free trade and migration. But while Trump ran as a populist, he has governed as a plutocrat, most recently by endorsing the discredited supply-side theory of taxation that most Republicans still cling to. Trump also ran as someone who would “drain the swamp” in Washington, DC, and on Wall Street. Yet he has stacked his administration with billionaires (not just millionaires) and Goldman Sachs alumni, while letting the swamp of business lobbyists rise higher than ever. Trump and the Republicans’ plan to repeal the 2010 Affordable Care Act (Obamacare) would have left 24 million Americans – mostly poor or middle class, many of whom voted for him – without health care. His deregulatory policies are blatantly biased against workers and unions. And the Republican tax-reform plan that he has endorsed would overwhelmingly favor multinational corporations and the top 1% of households, many of which stand to benefit especially from the repeal of the estate tax. Trump has also abandoned his base in the area of trade, where he has offered rhetoric but not concrete action. Yes, he scrapped the Trans-Pacific Partnership (TPP), but Hillary Clinton would have done the same. He has mused about abandoning the North American Free Trade Act (NAFTA), but that may be just a negotiating tactic. He has threatened to impose a 50% tariff on goods from China, Mexico, and other US trade partners, but no such measures have materialized. And proposals for a border adjustment tax have been all but forgotten. Trump’s bullying tweets against US firms that move production offshore or undertake tax inversions have been no more than cheap talk, and business leaders know it. Manufacturers who fooled Trump into thinking they would keep production in the US have continued to transfer operations quietly to Mexico, China, and elsewhere. Moreover, international provisions in the pending tax legislation will give US multinationals an even greater incentive to invest, hire, and produce abroad, while using transfer pricing and other schemes to salt away profits in low-tax jurisdictions. Likewise, despite Trump’s aggressive rhetoric on immigration, his policies have been relatively moderate, perhaps because many of the businesspeople who supported his campaign actually favor a milder approach. The “Muslim ban” doesn’t affect the supply of labor in the US. Although deportations have accelerated under Trump, it’s worth remembering that millions of undocumented immigrants were deported under Barack Obama, too. The border wall that Trump was going to force Mexico to pay for remains an unfunded dream. And even the administration’s plan to favor skilled over unskilled workers will not necessarily reduce the number of legal migrants in the country. All told, Trump has governed like a plutocrat in populist clothes – that is, a pluto-populist. But why has his base let him get away with pursuing policies that mostly hurt them? According to one view, he is betting that social conservatives and white blue-collar supporters in rural areas will vote on the basis of nationalist and religious sentiment and antipathy toward secular coastal elites, rather than for their own financial interests. But how long can anyone be expected to support “God and guns” at the expense of “bread and butter”? The pluto-populists who presided over the Roman Empire knew that keeping the populist mob at bay required substance as well as diversion: panem et circenses – “bread and circuses.” Raging tweets are meaningless to people who can scarcely afford a dignified living, let alone tickets to the modern-day Colosseum to watch football. The tax legislation that Republicans have rushed through Congress could prove especially dangerous, given that millions of middle-class and low-income households will not only get little out of it, but will actually pay more when income-tax cuts are phased out over time. Moreover, the Republican plan would repeal the Obamacare individual mandate. According to the nonpartisan Congressional Budget Office, this will cause 13 million people to lose health insurance, and insurance premiums to rise by 10%, over the next decade. Not surprisingly, a recent Quinnipiac poll found that a mere 29% of Americans support the Republican plan. Nevertheless, Trump and the Republicans seem willing to risk it. After all, by pushing the middle-class tax hikes to a later date, they have designed their plan to get them through the 2018 midterm elections and the 2020 general election. Between now and the midterms, they can brag about cutting taxes on most households. And they can expect to see the economic-stimulus effects of tax cuts peak in 2019, just before the next presidential election – and long before the bill comes due. Moreover, the final legislation will likely lower the federal deduction for mortgage interest and eliminate deductibility for state and local taxes. This will hit households in Democratic-leaning states such as New York, New Jersey, and California much harder than households in Republican-leaning states. Another part of the Republican strategy (known as “starve the beast”) will be to use the higher deficits from tax cuts to argue for cuts in so-called entitlement spending, such as Medicare, Medicaid, food stamps, and Social Security. Again, this is a risky proposition, given that elderly, middle-class, and low-income Americans rely heavily on these programs. Yes, the working and non-working poor who receive welfare payments or food stamps include minorities who tend to vote for Democrats. But millions of the blue-collar, socially conservative whites who voted for Trump also rely on these and similar programs. With the global economy expanding, Trump is probably hoping that tax cuts and deregulation will spur enough growth and create enough jobs that he will have something to brag about. A potential growth rate of 2% won’t necessarily do much to help his blue-collar base, but at least it could push the stock market up to its highest point ever. And, of course, Trump will still claim that the US economy can grow at a rate of 4%, even though all mainstream economists, including Republicans, agree that the potential growth rate will remain around 2%, regardless of his policies. Whatever happens, Trump will continue to tweet maniacally, promote fake-news stories, and boast about the “biggest and best” economy ever. In doing so, he may even create a circus worthy of a Roman emperor. But if gassy rhetoric alone does not suffice, he may decide to go on the offensive, particularly in the international sphere. That could mean truly withdrawing from NAFTA, taking trade action against China and other trading partners, or doubling down on harsh immigration policies. And if these measures do not satisfy his base, Trump will still have one last option, long used by Roman emperors and other assorted dictators during times of domestic difficulty. Namely, he can try to “wag the dog,” by fabricating an external threat or embarking on foreign military adventures to distract his supporters from what he and congressional Republicans have been doing. For example, following the “madman” approach to foreign policy, Trump could start a war with North Korea or Iran. Or he could post further inflammatory tweets about the evils of Islam, thereby driving disturbed and marginalized individuals into the arms of the Islamic State (ISIS) or other extremist groups. That would increase the likelihood of ISIS-inspired attacks – for example, “lone wolves” blowing themselves up or driving trucks through crowded pedestrian areas – within the US. With dozens, if not hundreds, slain, Trump could then wrap himself in the flag and say, “I told you so.” And if things got bad enough, Trump and his generals could declare a state of emergency, suspend civil liberties, and transform America into a true pluto-populist authoritarian state. You know it’s time to worry when the conservative Republican chairman of the Senate Committee on Foreign Relations, Bob Corker, warns openly that Trump could start World War III. And if you’re not convinced, consider the recent history of Russia or Turkey; or the history of the Roman Empire under Caligula or Nero. Pluto-populists have been turning democracies into autocracies with the same playbook for thousands of years. There’s no reason to think they would stop now. The reign of Emperor Trump could be just around the corner. 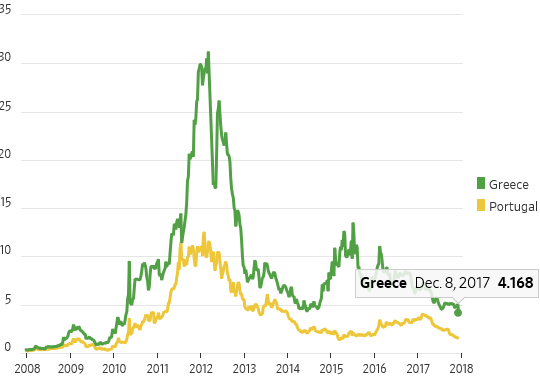 Greece, the place where Europe’s sovereign-debt crisis first emerged, finally looks like it could escape its bailout years. Yield-hungry bond investors are smartly going along for the ride. Greece’s third bailout program is due to end in August 2018. Ireland, Portugal and Cyprus have all exited their bailouts; only Greece remains. Recent reviews with the International Monetary Fund and eurozone creditors have gone smoothly, in stark comparison with previous rounds. There has been nothing like the 2015 standoff that led to a Greek bank shutdown and capital controls. Greece’s exit from the bailout program could be an economic boon as well as a political prize: years of clashes with Europe have investor sentiment and activity in Greece. Of course, Greece’s economy still faces big challenges: it has barely grown in recent years, and it has the heaviest debt burden of any European sovereign, although long maturities on its bailout loans provide some cushion. But the direction of travel is encouraging. Greece has recorded three consecutive quarters of growth in 2017 for the first time since the crisis. Unemployment, while still far too high at above 20%, has fallen from a peak of near 28%. Bank deposits, while down 45% from their peak, have stabilized and risen 4.4% this year to their highest since 2015, and banks have started to return to bond markets. Excluding debt payments, Greece’s government is spending less than it takes in, and its near-term debt redemptions are manageable. As with other bailouts, the first condition for exit is relative stability. That is being reflected in bond markets and should continue. Ten-year Greek bond yields last week fell below 5% for the first time since 2009. In yield terms, Greece is still an outlier: its two-year bonds trade with a positive yield, while Irish and Portuguese short-dated yields have turned negative along with the rest of the eurozone. Greece represents the last big bet on lower yields left in European government bonds. Moreover, if Greece is to exit its bailout, it will need to keep the bond market happy: building a cash buffer, as Ireland and Portugal did, will be an important step. Greece’s economy has a long way to go to repair the damage done by the crisis. But a bailout exit, which once seem far fetched, now looks like something to bet on. Over the past many years, we have been highlighting one concept that many people fail to understand and utilize – the longer term Generational Cycle. This is important because of two reasons; first, it has been in place and accurate for over 400 years and, second, it identifies events, opportunities and Archetypes that we should be aware of. Are you ready to learn about these massive cycles and how they relate to the markets and how they create massive opportunities? Where are we currently in this cycle process? What can we learn from the past and what can we do to prepare for the future? 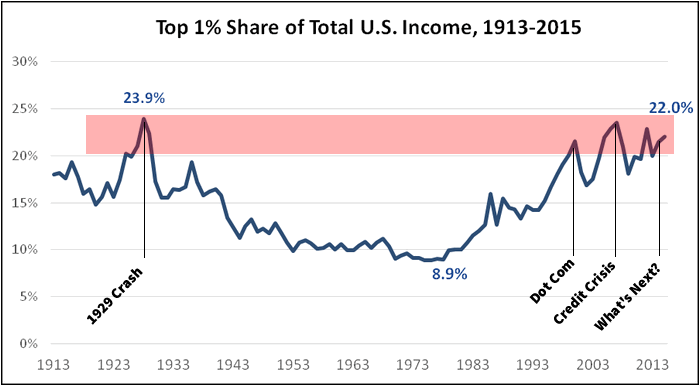 This chart below shows the share of total US income represented by the Top 1% of all earners. As you can see, current levels (as of 2015) are near 22% and are near the highest levels over the past 80+ years. 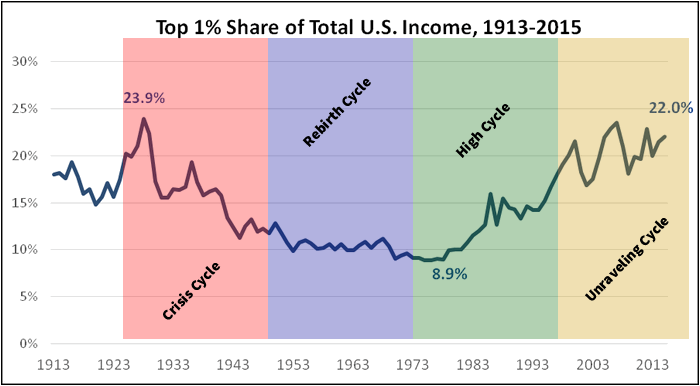 When the Top 1% earn more than 16~17% of all income, there is a disparity in income opportunity across all levels of income and, as history has shown, an economic or social even may be eminent to restore some opportunity to the lower income levels. The general principle of the Generational Cycle is that 50 to 85 years after a major social, economic or geopolitical event, society (meaning the general populous) has forgotten the lessons learned from that event and is somewhat destined to repeat it (in some form). The last massive social, economic and geopolitical event on record, which is also the last known “Crisis Cycle” was the 1926 to 1949 span that included the end of the Roaring 20s, the Great Depression, Pearl Harbor, World War II, A US Banking Crisis, Atomic Weapons, NATO created. This cycle event is known for the upheaval that is created by a destruction of fundamental pillars of society and economic success found within the previous 50+ years. The next cycle event that follows the Crisis Cycle is the “Rebirthing Cycle”. Historically, this cycle executed from 1950 to 1972 and was a time where society pulled together from the previous cycle event, developed new foundations and developed opportunities from technology, infrastructure and strengths that were fostered from the Crisis Cycle. As you can probably imagine, the events of the Crisis Cycle had a lasting result for generations to come. The Rebirthing Cycle was a result of the chaos and uncertainty of the previous cycle and the people alive at the time were cautious and calculated in their planning. The next cycle event is the High Cycle. Historically, this cycle executed from 1972 to 1995 and was a time of accelerated success, prosperity and excess. The High Cycle is when nearly every aspect of the Rebirthing Cycle is firing on all cylinders – the economy is good, housing is good, there is plenty of excess for everyone. Governments feel they can do no wrong and spending is through the roof.. What could go wrong – right? This cycle is like a perpetual high that creates wealth and prosperity while creating massive debt loads for some. Then comes the Unraveling Cycle. By our estimates, we’ve just completed the Unraveling Cycle between 1996 to 2017~18. The Unraveling Cycle is when the structures, foundations and pillars that society built after the last Crisis Cycle begin to crumble. Financial systems start to collapse with debt (pensions, state and local governments, entitlements, global governments). Unique sectors of the global markets start to appear fragile, debt-laden and mismanaged. Remember, the previous cycle event, the High Cycle, was a period of time when everything was super, one could do not wrong and growth would continue forever…. but now, things seem different.. not so super.. and maybe not keep growing forever. I equate the Unraveling Cycle to your car’s engine starting to fall apart. As long as you keep gassing it (QE and bailouts) with Ether, you can probably keep it running for a while longer – but eventually it will completely die and require a complete rebuild or replacement. So, now that you have been briefed regarding the massive Generational Cycles, how do you profit from these future events? That answer is simple, prepare yourself and your investments for the potential that we could be entering a time of great upheaval and repositioning. Find partners, like TheTechnicalTraders.com, that can assist you in identifying key market rotations, opportunities and help you stay out of trouble. Remember, just like in the 30s and 40s, the markets continue to move, there are still opportunities to invest and there are still opportunities to profit. One just has to be aware of where the opportunities will be presented and what to watch out for while navigating these tricky waters. Remember, these cycle events are opportunities for you to prepare, plan and execute for success. IN many cases, these are once in a lifetime event that can provide nearly unlimited opportunities for success. Make sure you have the right partners to assist you in executing for profits.